Chandigarh , 22 September : Rakesh Dahiya, a Government school teacher of Chandigarh, He is working at Govt. Model Sr Sec School, Sector 38 West, Dadu Majra Colony. For his meritorious service he has been awarded with th “Nation Builder Award” by the Rotary International under their ‘India Literacy Mission’ programme during a Award Ceremony at Hotel Shivalik View, Sector 17, Chandigarh in the evening of 21st September, 2018. 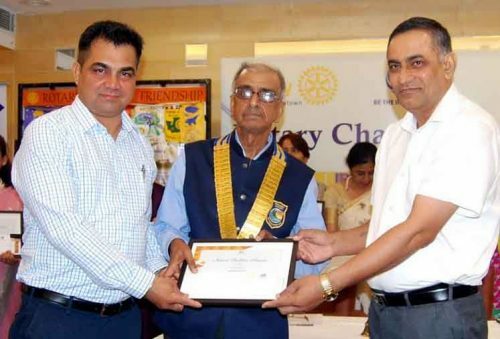 Chief Guest Dr. Anoop Singh and President Rotary Midtown Chandigarh Mr. Ashok Puri felicitated Mr. Dahiya with a memento and an appreciation certificate.